I do enjoy them and the fact that they’re an immense reservoir of calcium and vitamin C places them high on my personal consumption list. I sneak them into lasagna, roll them into tortillas, mash them into potatoes, use them as wraps for interesting appetizers and seek out other family-friendly recipes. Regardless of my own preference, week after week of greens is challenging for me and for other CSA participants. The monotony reminds me of nagging my middle son to practice his violin scales and of the advice of Natalie Goldberg in her bestseller, Writing Down the Bones. Goldberg gives eloquent instruction to struggling writers: “in order to become a writer, write.” In other words, practice makes perfect or if you do one thing for 21 days consecutively, it becomes a habit or take the 30-day challenge. They all mean the same thing. There are times when slogging through a less favorite task has to be done and once again, it’s part of the journey and ultimately part of the payoff. It’s drudgery when approached that way but if you do the old-fashioned Zig Ziglar approach, “it’s gonna be a great thing. Okay, I admit, Ziglar always made me a bit crazy but if we approach our tasks as a process and know that the result will benefit from our actions, the thought of hammering out another blog post or sauteing a bucket of kale is gets easier. It helps us be prepared and someone told me that luck is when opportunity meets preparedness. Luck of the Irish to you. Happy St. Patrick’s Day! Why did the Democrat cross the aisle? Coolers with a can is the way many of us handle the abundance of citrus here in the SW. Is there a farmer’s market nearby? at our market, the eggs always sell out first. can you please dispense with all this pure vegetable stuff and write about “hybrids”—-like vegan doughnuts??? We may just have to whip up a batch of a hidden treat for you! Great post tammy. It is about the journey and thanks for the reminder! The arugula in my backyard is another of those “oh no, what do I do with it now?” When it’s small, we break pieces off and eat it, we toss it in salads and saute it with vegetables. Then it gets huge (the wild variety reaches up to 4 feet). One year I made spanakopita substituting the arugula for the spinach. It was great! Great idea Lisa. You can sometimes “cook” some of that pepperyness out of the arugula. Any suggestions for Suzanne above who has 18 eggs a day? Well, 18 eggs a day is a lot. The best suggestion I have is to cook meals ahead of time that include eggs and freeze them. One breakfast idea is English muffin sandwiches: mix up eggs with cooked sausage and cook in a pan (don’t stir, just occasionally lift a bit of the side to let the egg run under to cook). When done, slide to a cutting board and cut with a biscuit cutter the size of your muffin. Assemble your muffin with the cooked egg and a slice of cheese. Wrap in wax paper and put several of these into a freezer bag. When you’re ready to eat, just pull one out and microwave for a minute or so. There is a comment further down that mentions quiches. I love making mini-quiches for parties–just mix up eggs, chopped onion, tomato, a bit of shredded cheese and pour into mini muffin tins. Bake at 350 for about 10-12 minutes and serve. These are also good for freezing. Oh, what I wouldn’t give to be getting a variety of delicious greens in my CSA. We got spinach for the first time in months this week, but it’s mostly just been mâche, week after week. What can’t you do with eggs? 🙂 Quiches, cakes, custards, meringues, marshmallows, omelettes, frittata… although 18 a day does sound like a lot to keep up with! Silly question but is the CSA concept alive in France as well? I wouldn’t have thought it so with all of the lovely markets. Contrary to popular belief, most of the markets in Paris are NOT farmer-run or based. They are people who buy produce in bulk at the Rungis market, which comes from all over. So yes, CSA is gaining popularity in France as well. No. You cannot mash them into potatoes. Posting this just made me realize I never posted the recipe and what we thought of it. The combination was remarkably delicious. Thanks for commenting on my blog. I’m a virgin blogger and a comment is sooo exciting! I was happy to read that you are a breast cancer survivor, congrats! I am as well, almost 8 years now. It is interesting to me that we both have a veggie and CSA fascination. Health is definitely a big priority for us, now isn’t it? 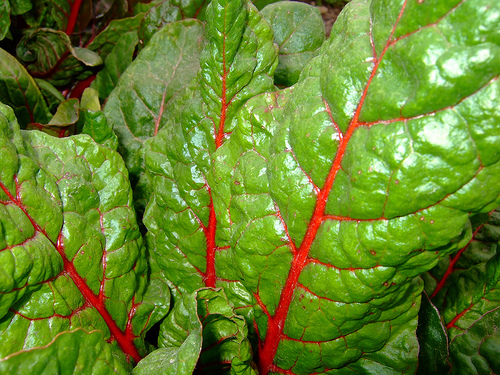 I love Swiss Chard, but I’m always grateful when it’s not included in my CSA Bag because I also grow my own. Ditto with Mustard greens. I have those coming out of my you-know-what! I do have a few recipes that use greens in general on my blog: Spring Forward Pizza, Linguine with Swiss Chard and Dill/Feta/Rice Bake. Thanks for stopping by Luann and letting me know of our commonality. I’ll check out your greens recipes too. I began blogging in January and really have learned a lot! Every time I get overwhelmed by fresh greens of any kind I find myself considering stepping into the world of Vitamix juicing. I have a friend who swears by both the flavor and healthfulness of his bright green smoothies. Here in New Hampshire in March, I’m not knee deep in greens right now, but I could be again in a month or two. I just may do it! I doubt there’s any healthier way to consume leafy vegetables. I just got my first Vitamix and I love green smoothies! Gosh, I do understand how endless greens could get tiring (and from the opposite end of the spectrum, it was also tiring as a kid to “be” nagged by the mother to practise my piano scales :P), but right now I’m so envious! My greens in Paris have consisted of 250g bags of raw broccoli for 2.20 Euros, which is pretty much daylight robbery, but I need veggies to balance out the macarons, cheese, and patisserie treats! Thanks Hannah. That’s a good message for me to hear. I need to appreciate what I’m getting.